Before their fans, the black and whites were in the lead for the most part of the first half, but Crvena zvezda MTS made a turnaround in the third quarter, and in the end they won with the score 71:77 (22:15, 19:23, 10:20, 20:19). In the ninth round of the regional ABA League, the black and whites lost from Crvena zvezda MTS in a home game, with the score 71:77. The black and whites' captain, Novica Veličković was back on the team, and the guests had a starting 0:7, but the black and whites had an answer, so, near the end of the first quarter, the score was 22:12. In the second quarter, the black and whites maintained the advantage, but Zvezda came to only -3 before the 15-minute break. In the introductory minutes of the second half, there was a turnaround in the result, which guests managed to turn into a double-digit advantage in the final quarter. Until the end of the game, the black and whites managed to reduce the difference to the final 71:77. At the press conference after the game, Partizan NIS' coach, Andrea Trinchieri took responsibility for tonight's defeat. ​"The third quarter was crucial, and we lost offense, defense, and there were individual solutions, and we're not good enough to play like that. I feel sorry for the President of the club and for the fans. They gave everything so that this can look better. This is on me. It's my fault, there isn't much more to it. I didn't use the right words, I tried to get the team to be ready to play, but they were ready for 20 minutes only. I repeat, this is on me. I'm sorry because I think that we're on the right path, but sometimes words aren't enough"​, Trinchieri pointed out. The FIBA window is next, and after two weeks, the clubs will return to the regular competition. 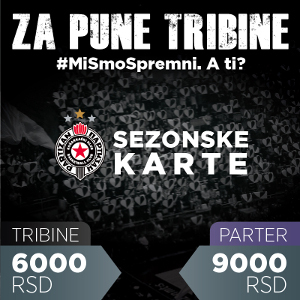 Partizan NIS are playing their next game on December 8, in Laktaši, against Igokea. Trichieri before another duel with Zvezda: "Players, coaches, we all have to be better"
Trinchieri before the ABA League playoffs: "I look at my team, and I like what I see. We won't give up, we know what's at stake"